It is my third time attending the Business Innovation Factory conference (see my BIF-9 preview post) – while some of the themes are similar year-to-year, there are always new items and trends that bubble to the forefront. After the first day of amazing speakers, the thread that ran through many of the stories that I heard was how the promise of the collaborative (or sharing) economy is poised to take off. Malcolm Gladwell states that a tipping point is where an idea, product or message spread like a virus. The proof points included 3D printing, Kickstarter projects and a many other cases where individuals or small groups could leverage communities to deliver results that are often greater than what large organizations could. While 3D printing is not new or even a new topic at BIF, the price and availability of the technology are poised to allow people to take the maker revolution to the next step. Seventeen-year-old Easton Lachapelle is an inventor of a 3D printed brain powered robot arm. His current 2nd generation arm (here’s a Vine of him showing it off) costs $400 to produce, weighs under 10 pounds, and it is activated by brainwaves. His 3rd generation will be lighter, stronger (carbon fiber) and faster. On the other end of the experience spectrum, Ping Fu (amazing story – forced out of China, hired Marc Andreesen as a student research, worked on early web and much more) is proving that 3D printing could be “as big as the Internet” for transforming business. Check out Ping’s Twitter page to see her 3D printed shoes – she jokes that she’ll never need to pack shoes again, just print them at her destination. Customization, the sharing of templates and the access to rapid results and iteration can bring people into the design process or completely change the purchasing process. The co-founder of StockTwits, Howard Lindzon pointed to Stratasys ($SSYS) – the company acquired Makerbot – as a hot stock of the 3D printing wave. There were so many examples of engagement models changing with the help communities and low-cost methods. Doug Ulman of Livestrong explained how the $1 yellow wristband provided such a low barrier to participate; and the primary goal of the organization was to build community for sharing experiences. Food geek Scott Heimendinger used Kickstarter to launch an inexpensive sous vide immersion circulator (high-tech food gear) – raising hundreds of thousands of dollars more than the original plan. And Bruce Nussbaum spoke about how startups like Zipcar and Uber are capitalizing on new business models that existing companies can’t or won’t. Bruce said that companies should allow newer generations to help usher in this change. Collaboration is a big part of my day job doing community-focused research for IT with Wikibon and we see huge opportunities for data (yes – big data too) to transform industries. There are also the companies like Airbnb that are looking to taking sharing and new business models to a new level (see Jeremiah Owyang’s announcement today for more on this topic). 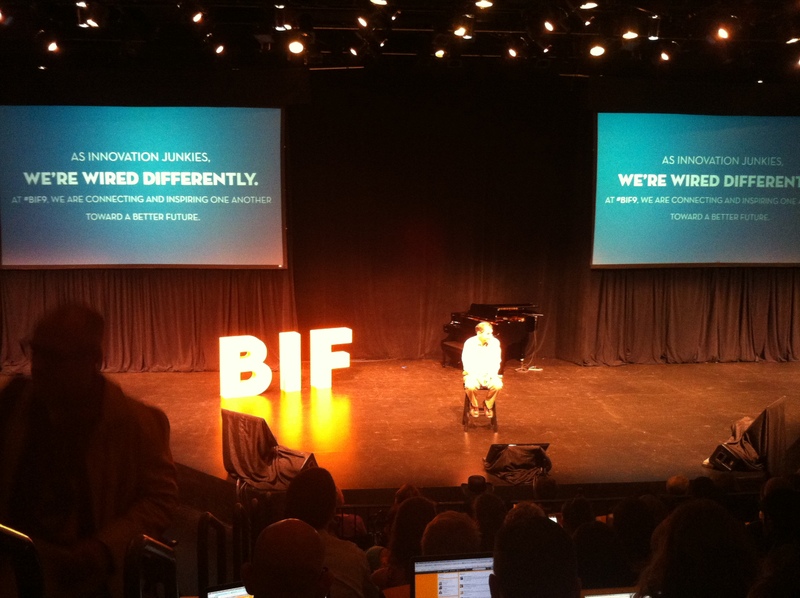 By FAAARRRR, the #1 principle behind #BIF9's genome: don't be a spectator in life. Go all in. Show up. Think rrrrrrealy, really big. Disclaimer: I am attending BIF-9 on a free blogger pass, which gives me free admission (conference includes meals). In the technology world, discussions of innovation are usually focused on invention – the creation of new technologies. I grew up in NJ where Bell Labs was an inspiration for me to study engineering and a proud legacy to discuss during my time in sales with Lucent Technologies. Innovation encompasses much more than the ideation moment or even the delivery of new ideas to the market place. If we look at some of the big societal challenges such as healthcare and education, there isn’t a silver bullet to be found through technology or finance. Change for any existing process or business is not easy and requires a different approach such as business model innovations, a technique promoted by Saul Kaplan in his book, his team and his conference (BIF-9 is this week). Don’t say you don’t have enough time. You have exactly the same number of hours per day that were given to… Leonardo da Vinci, Thomas Jefferson, and Albert Einstein. For 2 days this week, I’ll be taking a break from the very busy world of cloud computing, software-defined data center and big data while I immerse with fellow innovation enthusiasts. I’ll be tweeting and writing about BIF-9 this week. See my articles from BIF-6 and BIF-7. For an update on my activities with Wikibon, check out our software-led infrastructure page. I will be at Oracle Open World and Amazon re:Invent later this year.